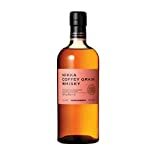 \"50cl / 51.4% - We've said it before - many times in fact - Nikka's Whisky from the Barrel is staggeringly good stuff, with just the right balance of toffee sweetness and rich malty flavour and a tinge of smoke for complexity and depth. \"
Nikka Blended Whisky offers an expression in the typical Japanese style. Smooth and intensely fruity, it has established itself as the most accessible of the Nikka blends. This expression is available exclusively in Europe. Mainly composed of Yoichi distillery malt, Black is characterized by powerful peat, rich taste and firm flavour. "70cl / 43.0% - A fantastic 12 year old blended Japanese whisky from Nikka presented in a bottle that takes its design from the neckline of a kimono. Enjoy neat, over ice or in a classic highball."